Melvita Rose Floral Water - I picked this out as it came up as an offer while I was buying something else from Feel Unique and thought I'd try it out as I'd just finished the toner I was using. I have to say I'm quite disappointed by it but luckily I only paid a couple of pounds for this smaller size. This is suited for those who have sensitive skin which I have so I thought it would be perfect. It's almost too delicate and feels like I'm just spraying tab water onto my face. I haven't noticed any benefits when using it and although I'm going to use it up, I will not be buying another bottle or recommend it. £16 for 200ml. Vichy Aqualia Thermal Eye Roll On - This on the other hand, I absolutely love! I hadn't read anything about it but ordered it completely on a whim as I wanted a roller ball eye cream. The roller ball is really cooling and perfect for when I wake up and my eyes are puffy. Also when my hey fever is bad in the summer this really helps to soothe my skin. The product itself is a gel which means it's extremely light on the skin but is still moisturising enough. I don't like heavy eye creams, especially in the mornings, so this is perfect for me. £14.25 for 15ml. Dr. Andrew Weil For Origins Mega-Mushroom Skin Relief Advanced Face Serum - First prize for product with the longest name goes to this serum! I got a generous sized sample of this serum about a year ago and fell in love with instantly. I was able to use it enough to know I definitely wanted to buy the full size. I had a couple of other serums to use first but I finally bought this serum a couple of months ago. I still like it just as much as I did when I first tried it. I use this serum for when my skin needs something soothing but still moisturising and pair it with the moisturiser from the same range. This also helps the appearance of redness which I suffer from because of eczema. £46 for 30ml or £58 for 50ml. Clarins Blue Orchid Face Treatment Oil - I've wanted to try one of the Clarins Treatment Oils ever since Kate raved about the Lotus version. I chose Blue Orchid when making my order as I have more dehydrated and dry skin so thought this best suited me although I don't think you can go wrong with any of them. A couple of drops massaged over the face and it feels, and smells, like you're in a spa. I reach for this when I have visible dry patches on my skin as they are instantly soothed and disappear after just one use. 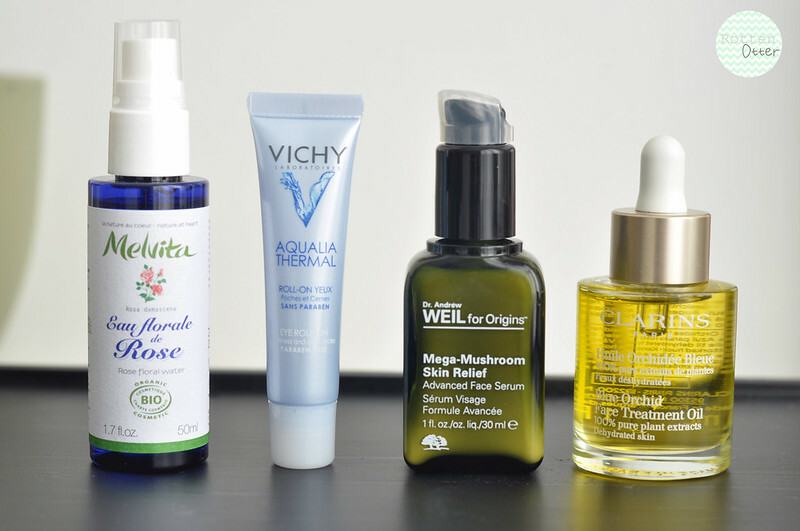 For days when my skin isn't so dry, I like to mix a drop or two into my moisturiser for an extra boost as I find it sinks into my skin more easily. This is currently the only facial oil I have in my collection and I'm in no hurry to try something new. The packaging is simple, it looks nice sitting on my dressing table, but also really easy to use and control how much product you're using. I've been using this for a while now and it hardly looks like I've used it and despite the price, it's going to last a really long time making it more affordable. £24 for 30ml. I have also used the clarins and i so love it. It really moisturizes my skin. I wanna try also the Dr. Andrew Weil for it looks like a great product to try out.